When I first heard about this collection, I was expecting it to be retellings of fairytales in poems or short stories. While this is sort of what this book is about, there is so much more to it than that. 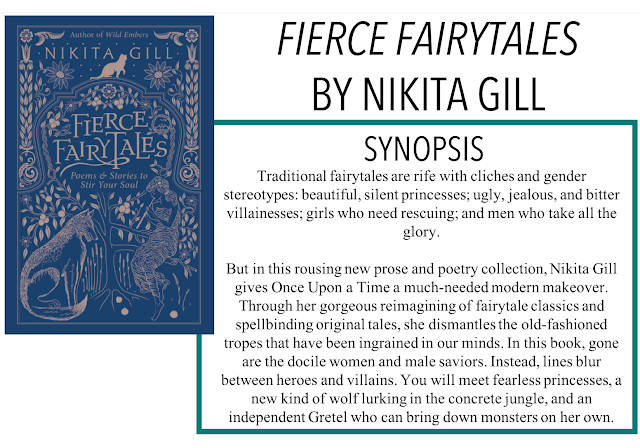 I am back with another review, Fierce Fairytales: Poems and Stories to Stir Your Soul by Nikita Gill. Thanks so much to Hachette Book Group Canada for sending me a copy of this book for an honest review, as always, all opinions are my own. This book is essentially a collection of poems - some short and some long - as well as a few longer pieces I would call very short stories. They cover not only fairytales but social issues as well. The fairytales all have a "fierce" feminist sort of twist, either with dismissing the necessity of a 'Prince Charming' or explaining why the logic that puts such a necessity on one is flawed. I also found it very refreshing to see not only feminist ideas but also those touching on more general social issues like eating disorders, toxic masculinity, being a refugee or immigrant, racial issues, and many more. I don't think this will be a very long review because this is just not a very long book, but I will say that I found Gill's prose absolutely riveting. I found myself tabbing and underlining (I KNOW) lines of poems and full paragraphs. It's been a really long time since I've had the urge to do that to a book I wasn't reading for school and while I didn't want to "wreck" my book (which is another topic for a whole other discussion), I also couldn't resist doing it. Not only did Gill take the typical fairytales and give them a feminist or more modern twist she also worked to explain characters that have been glossed over or labelled as purely evil to become a plot point. Evil stepmothers come from the anger of being heartbroken widows who see the beauty of their youth reflected back in a daughter they didn't ask for. Witches are made from women living alone, outside of society's allocated position for them. I found these stories and poems really interesting and fascinating takes on "villainesses." Overall, this is a beautifully written and provocative collection of poetry and prose that you will definitely want to pick up.